The findings, presented in Science, suggest that the magnetopause—the boundary where the Earth's magnetic field successfully deflects the Sun's incoming solar wind—was only half the distance from Earth it is today. "With a weak magnetosphere and a rapid-rotating young Sun, the Earth was likely receiving as many solar protons on an average day as we get today during a severe solar storm," says John Tarduno, a geophysicist at the University of Rochester and lead author of the study. "That means the particles streaming out of the Sun were much more likely to reach Earth. It's very likely the solar wind was removing volatile molecules, like hydrogen, from the atmosphere at a much greater rate than we're losing them today." Tarduno says the loss of hydrogen implies a loss of water as well, meaning there may be much less water on Earth today than in its infancy. To find the strength of the ancient magnetic field, Tarduno and his colleagues from the University of KwaZulu-Natal visited sites in Africa that were known to contain rocks in excess of 3 billion years of age. Not just any rocks of that age would do, however. Certain igneous rocks called dacites contain small millimeter-sized quartz crystals, which in turn have tiny nanometer-sized magnetic inclusions. The magnetization of these inclusions act as minute compasses, locking in a record of the Earth's magnetic field as the dacite cooled from molten magma to hard rock. Simply finding rocks of this age is difficult enough, but such rocks have also witnessed billions of years of geological activity that could have reheated them and possibly changed their initial magnetic record. To reduce the chance of this contamination, Tarduno picked out the best preserved grains of quartz out of 3.5 billion-year-old dacite outcroppings in South Africa. Complicating the search for the right rocks further, the effect of the solar wind interacting with the atmosphere can induce a magnetic field of its own, so even if Tarduno did find a rock that had not been altered in 3.5 billion years, he had to make sure the magnetic record it contained was generated by the Earth's core and not induced by the solar wind. Once he isolated the ideal crystals, Tarduno used a device called a superconducting quantum interface device, or SQUID magnetometer, which is normally used to troubleshoot computer chips because it's extremely sensitive to the smallest magnetic fields. Tarduno pioneered the use of single crystal analyses using SQUID magnetometers. However, for this study, even standard SQUID magnetometers lacked the sensitivity. Tarduno was able to employ a new magnetometer, which has sensors closer to the sample than in previous instruments. Using the new magnetometer, Tarduno, Research Scientist Rory Cottrell, and University of Rochester students were able to confirm that the 3.5 billion-year-old silicate crystals had recorded a field much too strong to be induced by the solar wind-atmosphere interaction, and so must have been generated by Earth's core. "We gained a pretty solid idea of how strong Earth's field was at that time, but we knew that was only half the picture," says Tarduno. "We needed to understand how much solar wind that magnetic field was deflecting because that would tell us what was probably happening to Earth's atmosphere." The solar wind can strip away a planet's atmosphere and bathe its surface in lethal radiation. Tarduno points to Mars as an example of a planet that likely lost its magnetosphere early in its history, letting the bombardment of solar wind slowly erode its atmosphere. To discover what kind of solar wind the Earth had to contend with, Tarduno employed the help of Eric Mamajek, assistant professor of physics and astronomy at the University of Rochester. "There is a strong correlation between how old a Sun-like star is and the amount of matter it throws off as solar wind," says Mamajek "Judging from the rotation and activity we expect of our Sun at a billion years of age, we think that it was shedding material at a rate about 100 times stronger than the average rate observed in modern times." While the life cycle of stars like our Sun is well known, says Mamajek, astrophysicists have only a handful of stars for which they know the amount of mass lost as solar wind. Mamajek says the amount of X-rays radiated from a star, regardless of its apparent brightness, can give a good estimate of how much material the star is radiating as solar wind. Through the Sun at this age was likely about 23% dimmer than it would appear to us today, it was giving off much more radiation as X-rays, and driving a much more powerful solar wind. "We estimate the solar wind at that time was a couple of orders of magnitude stronger," says Mamajek. "With Earth's weaker magnetosphere, the standoff point between the two was probably less than five Earth radii. That's less than half of the distance of 10.7 radii it is today." 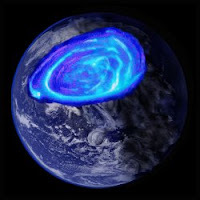 Tarduno says that in addition to the smaller magnetopause allowing the solar wind to strip away more water vapor from the early Earth, the skies might have been filled with more polar aurora. The Earth's magnetic field bends toward vertical at the poles and channels the solar wind toward the Earth's surface there. When the solar wind strikes the atmosphere, it releases photons that appear as shifting patterns of light at night. With the weakened magnetosphere, the area where the solar wind is channeled toward the surface—an area called the magnetic polar cap—would have been three times larger than it is today, says Tarduno. "On a normal night 3.5 billion years ago you'd probably see the aurora as far south as New York," says Tarduno.